Time flies! 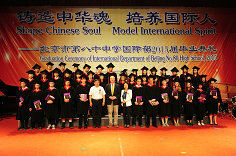 The International Department of BeijingNo.80 High School was so proud to congratulate new graduates on 2015 GraduationCeremony. 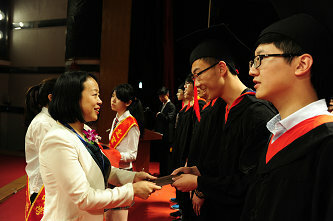 The whole school expressed their feelings and expectation tograduates. At the crucial stage of growing and learning, the graduates grewhappily with the care of teachers in No. 80 High School, which is delighted andgratified. 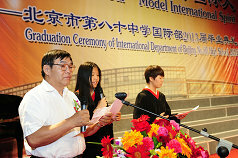 On June 1st, 2015, 2015 Graduation Ceremonyof International Department was solemnly held in the auditorium in 2 o’clock inthe afternoon. 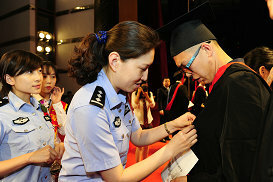 Besides graduates, parents, students and teachers, thespecial guests also attended the ceremony: they are Dai xin, vice-squadronleader in Beijing Municipal Public Security Bureau Exit-Entry Administration,Tang Yi, police officer in Beijing Municipal Public Security Bureau Exit-EntryAdministration, Li Yixin, teacher in international cooperation and exchange ofBeijing Municipal Education Commission, Yu Xiao, project director in foreignstudents office of International Cooperation Department of Peking University,Li Baoxin, secretary of the Communist Party Committee in Beijing No.80 HighSchool, ZHANG Enhai, president of AlumniPromotion Foundation of Beijing No.80 High School，and Li Xiaojun, VicePrincipal in Beijing No.80 High School. 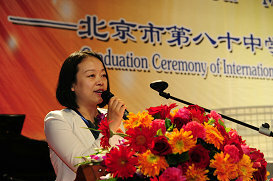 At the Graduation Ceremony, all thestudents, teachers and the guests reviewed and enjoyed a short memory video ofgraduates’ life; Li Baoxin, secretary of the Communist Party Committee inBeijing No.80 High School, gave a speech for the graduates; school leadersawarded graduate certificates to the students; and student representative andparent representative made speech respectively. 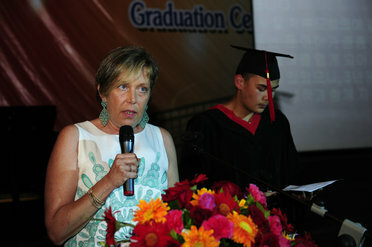 At the end of the ceremony, thegraduates made traditional performance for all people in the ceremony. The teachers in international department of BeijingNo,80 High School promote the internationalization of quality education andcultivate “internationals” with national culture to implementfeature-strengthened international education. 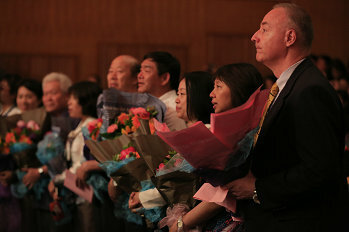 The total number of graduatesamounted to 124 in 2015, including 72 graduates from international class, 26foreign students from sino-international, 14 graduates from Hong Kong, Macao,and Taiwan, and 12 graduates from Chinese language seminar. All the graduatesin international class received offer from top universities in British and theUS. 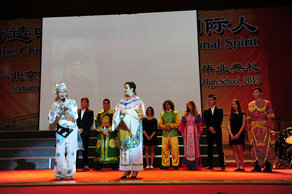 among of whom are WANG Zihao, receiving the offer from Emory University, WUAnqi, admitted by Wake Forest University, GUAN Chenxiao, admitted by Universityof Toronto, SHI Xuelin, receiving the offer from University of Southampton andUniversity of Nottingham, PANG Xiangtian and CUI Ying, receiving the offer fromNew York Academy of Art and Maryland Institute College of Art. Moreover, thegraduates in sino-international class got the higher score in College EntranceExamination, 15 of whom were admitted by Peking University. JIANG Zhaoying andAng Ha (full scholarship) were admitted by Guanghua School of Management ofPeking University. Eighteen foreign students passed the entrance examination ofTsinghua Universtiy. Although the students from Hong Kong, Macao and Taiwanjust finished the entrance examination, and we hope and believe that they willachieve their dream result. After one-year-study, the students in Chineselanguage seminar made great improvement in Chinese language proficiency, andall of them passed the Hanyu Shuiping Kaoshi (HSK). 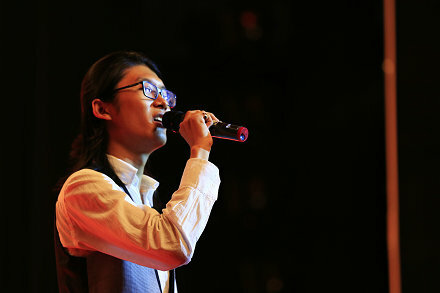 LU Liya, received the offerfrom Stanford University. In the end, 2015 GraduationCeremony ended successfully. 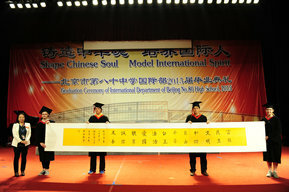 The graduates left Beijing No.80 High School withthe great expectations of all the students and teachers in NO. 80 High School.